Check this to add an overlay to each incoming photo. This can be used to automatically add frames or logos on top of photos. 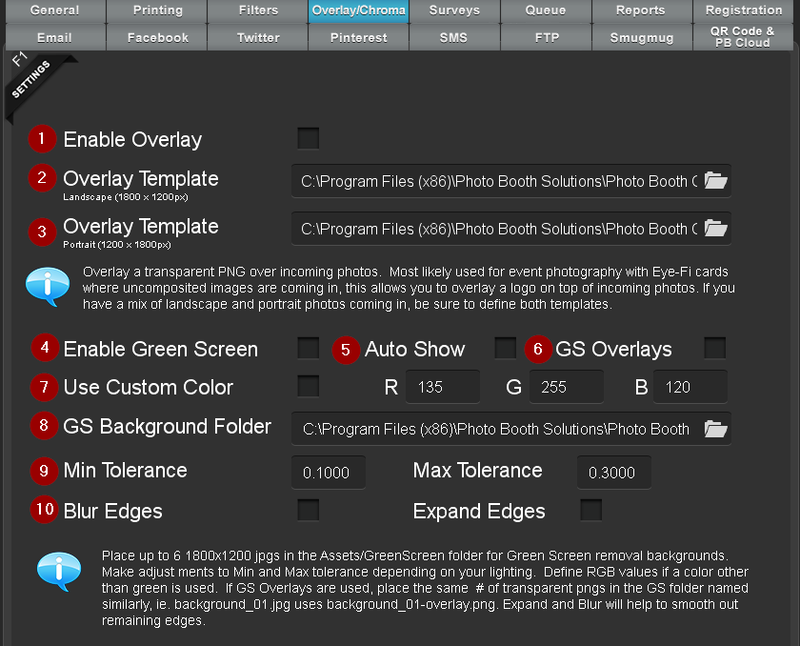 Check this to enable green screen or chroma key removal. Incoming photos will be processed and the green or chroma key will be removed and replaced with a different background. The user will be able to choose from 6 different backgrounds that you can customize. This means you can take your shots on the green screen and send the users over to the kiosk to select which background they want, rather than holding up the line. Note: If you don't want the user to choose their background, only have 1 background in the green screen folder, each photo will be automatically processed with that single background. This will show the green screen options as soon as the user selects their photo, before the filters (if filters are also enabled). Disabling this will show the green photo first, and the user will have to select the Backgrounds button to display the images with green removed. Enabling this will place another layer on top of the image after the green screen is removed, creating a sense of depth, like the users were standing behind something. The overlay should be a transparent png, the same size as the background, 1800x1200. You will need to name your overlay file in a specific manner and place it in the same folder as the background it is associated with. "background_01-overlay.png" is the overlay for "background_01.jpg" and so on. This will place the user in front of the Great Wall and then place the brick wall in front of them. The backgrounds should be 1800x1200 jpgs. With proper lighting, the default values of .1 and .3 should be fine for the min and the max. Adjusting these values can compensate for problems removing the green consistently due to lighting. If the min/max settings don't help, you can also try expanding the selection by a a pixel or 2 and also optionally blurring the edges. This doesn't always provide the best results, so try to work on the lighting and tolerance levels before resorting to these.